For months following the election results, Donald Trump’s most contemptible moments and shocking executive orders have inspired some equally outrageous works of art, a plethora of it scatalogically inclined, which has been pouring in like a barf fountain of protest art. In an attempt to make Protest Art Great again, we have collected some of the most hilarious anti-Trump artworks rebelling against the Trump’s Atrocious regime by artists out to Trump Mr. President. From Artists Defying Trump’s Muslim Ban with Their Art to hilarious caricatures which show us how absurd Mr. President can be, the outlandish cartoonishness of our President Elect hasn’t passed the notice of artists all over the globe. 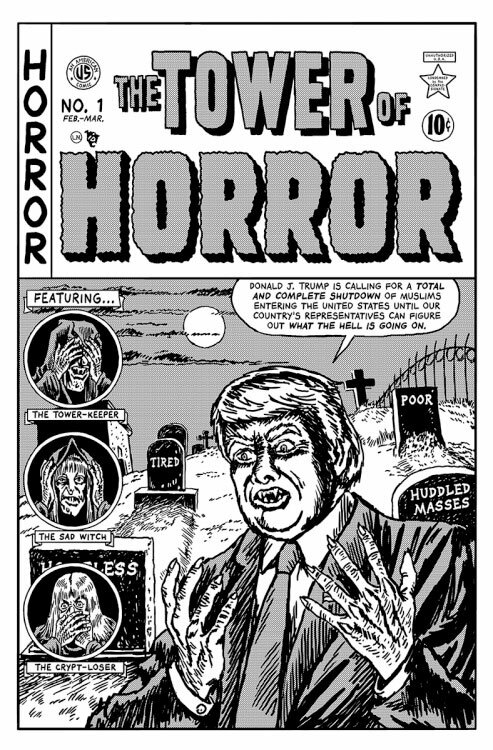 In a series of thought provoking and eye-grabbing illustrations, New York cartoonist Robert Sikoryak is transforming several of the offensive and controversial statements made by President Trump during the presidential election campaign to process his unexpected ascension to the White House. The idea struck him right before the elections when the barrage of outrageous things articulated by Trump became unbearable, making him want to catalogue them. As he didn’t want to put any words in his mouth, it was important to the artist that he used only the actual head-turning quotes uttered by Trump. Once Trump became the president-elect, he felt a compulsion to act out on his wish. Donald Trump can actually see himself become the villain now! The visual, political, and satirical manipulations of Syrian artist Saint Hoax, provide a snapshot for controversial current issues. 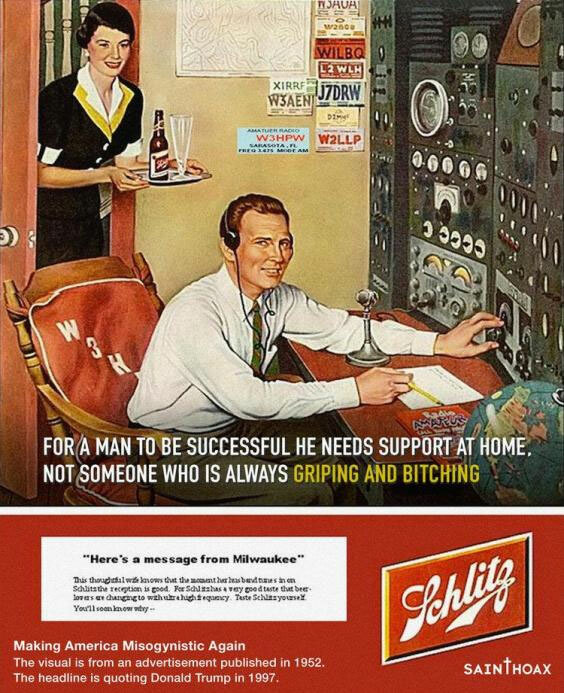 The Artist recently took vintage posters and misogynistic advertisements from the 1950s in a manifestation of social criticism, and overlaid them with quotes that Donald Trump is accused of having said about women in the past. After he noticed the striking similarities between Trump’s revoltingly sexist comments about women and the sentiments expressed by the adverts, he decided to match Trump quotes with the visuals and convert them into an art/awareness project, and published his project for the International Women’s Day 2017. U.K based Artist Conor Collins leverages President Trump’s own words against him in the impressive painting above. 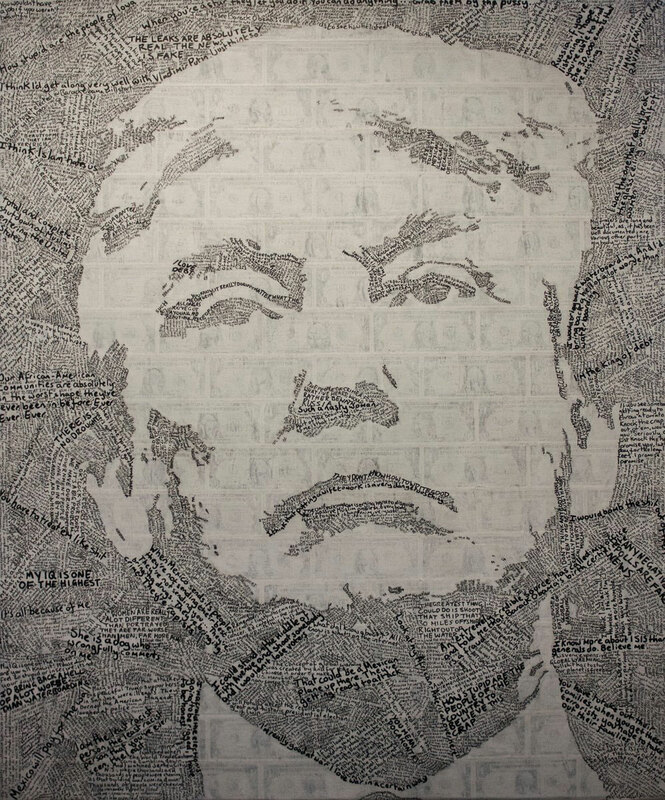 The portrait tweeted in January is entirely made using the bigoted, ignorant, sexist, and racist gibberish he has uttered over the years, and compiles quotes soured from @realDonaldTrump‘s Twitter, speeches, and his myriad interviews. In an era where technology is bringing us closer than ever, tyrants like him are struggling to separate us. It stops now! Collin’s post has gone viral, just like his other portraits created in a similar vain. This powerful illustration is part of a bigger project for the British artist, James Ostrer, titled “The Ego System,” which is a collection of “honesty portraits” of celebrities. 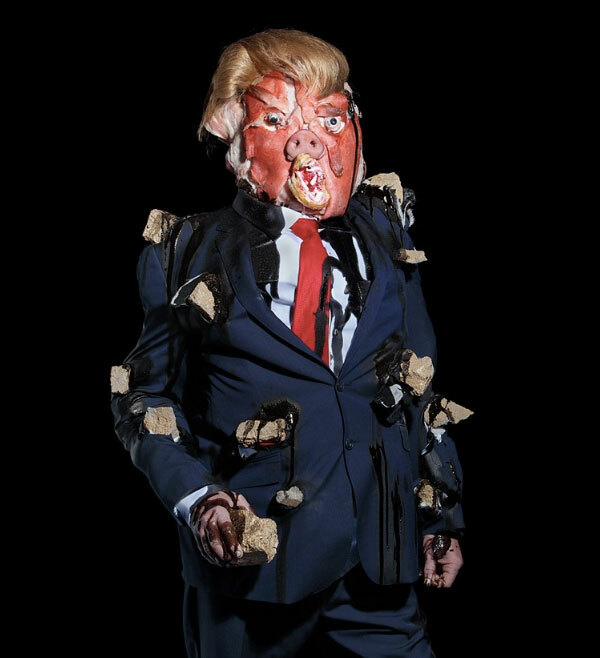 While his entire collection is imposing, it was his Trump portrait, fabricated from an unmistakably Trumpian wig, sheep’s eyeballs, and a pig’s snout that attracted international attention when it made an appearance in March at the Hong Kong Art Central fair. The portrait is a visual depiction of the megalomania that has soared up to the point where Trump’s constant need to be in the limelight is overriding any kind of care for anyone else or room for relationships in his life. 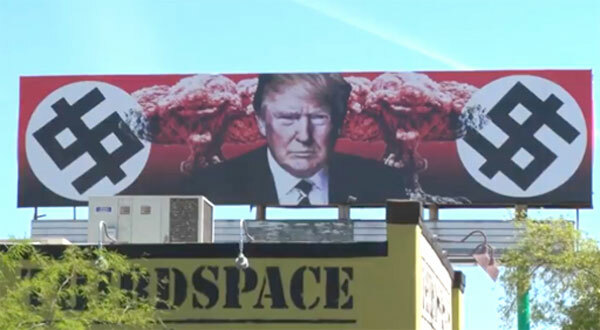 When Artist Karen Fiorito was commissioned in January by a downtown Phoenix art gallery to conjure up a billboard art piece commenting on the administration of President Donald Trump, she decided to stir up a controversy with her art. Now looming over Taylor Street and Grand Avenue, the completed billboard went up in downtown Phoenix amid the Art Detour event. 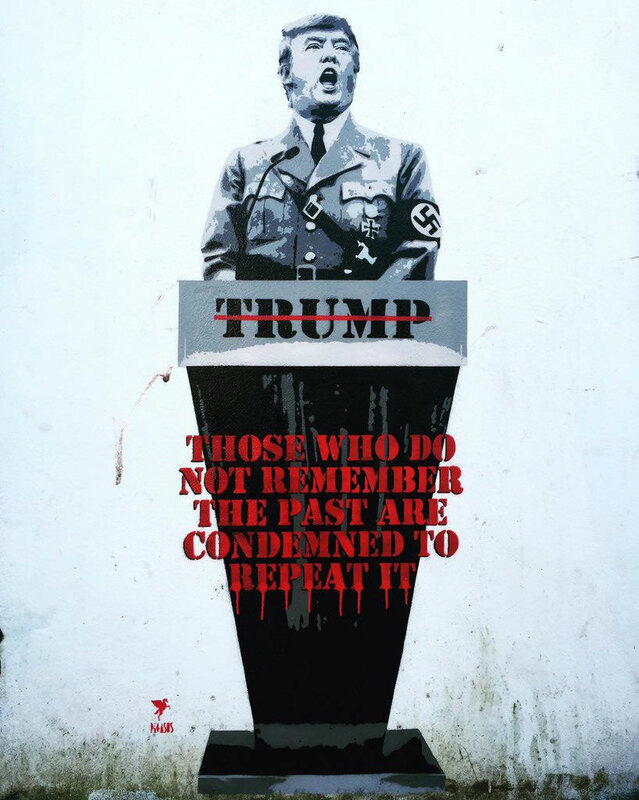 The poster clearly illustrates Trump’s face staring down, and the dollar signs in typography emulating Nazi swastikas and mushroom-cloud explosions are overlaid against a red background. Karen opted for a billboard to exhibit her art since people don’t have to visit a gallery to view a billboard, which adds to their popularity. 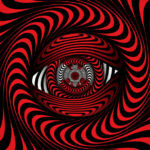 They allow you to reach out to people you would never have thought possible with any other form of artwork. The prevalent mood in New York was decidedly somber after the unexpected, and rather dreaded, victory of president-elect Donald Trump, since over an 80 percent of voters did not support the Republican candidate in the State! 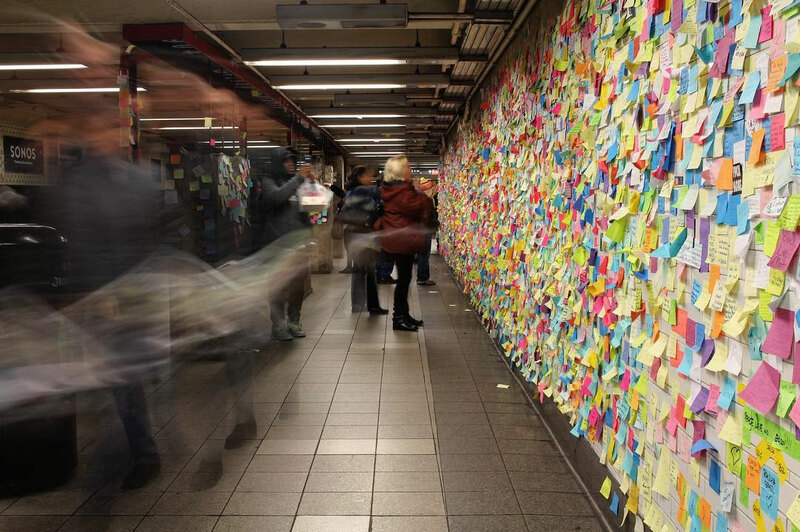 In the aftermath of the elections, Artist Matthew “Levee” Chavez came up with Subway Therapy, a communal art project that allowed strap-hangers to write messages on colorful Post-it notes for emotional catharsis at the city’s main subway station. The project kicked off in the 14th Street tunnel between the 2/3 and F/M stops on November 9 2016, and more than 2000 people responded to the call to “express yourself”, expanding the project up to Union Square. 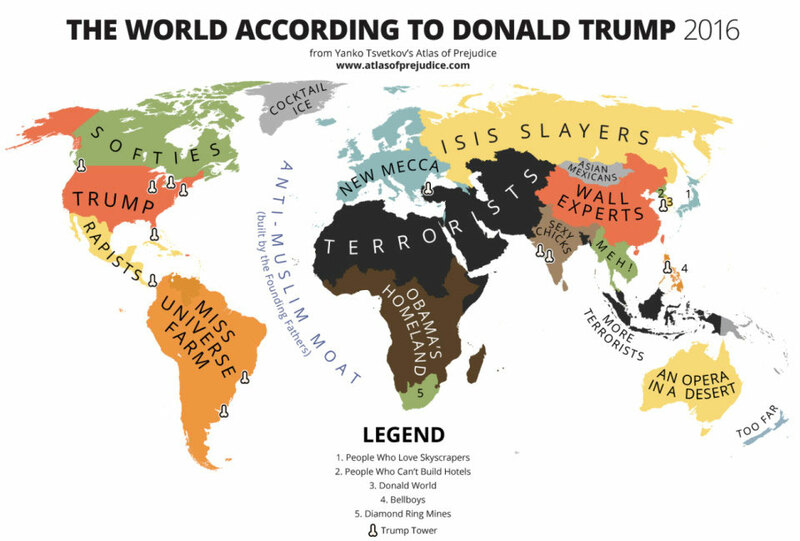 Bulgarian artist Yanko Tsvetkov has created an ingenious map portraying the world through the eyes of the President Elect, leveraging the Republican candidate’s own absurd policies and controversial views to design the map. The uncompromising creation labels the whole of Middle East ‘terrorists’, and the Central American country ‘rapists’, alluding to Trump’s tedious comments about Mexicans. 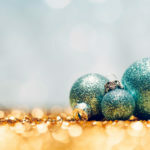 Tsvetkov dubs the billionaire a “racist uncle” on his blog, having the “mentality of a rural alcoholic”. London-based street artist, Pegasus, has conjured a stunning and potent illustration of Trump, on the side of the Hen and Chicken pub in Bristol, UK. The mesmerizing piece took 5 days in total- two to draw, two to design, and one to cut and paint. Pegasus believes that Trump is out to become the next tyrant in history. Each new hate speech made him appear more of a dictator than a presidential candidate, and Pegasus wanted people to see that in the most obvious way. According to Pegasus, history always repeats itself even though people surrender to fear mongering or are too ignorant to the fact. Hopefully his illustration, in addition to those by scores of other artists, would act as a much needed wake up call. Someone mentioned to William Powhida once that the whole Trump thing is only the Americanized version of President’s original Family name, Drumpf. 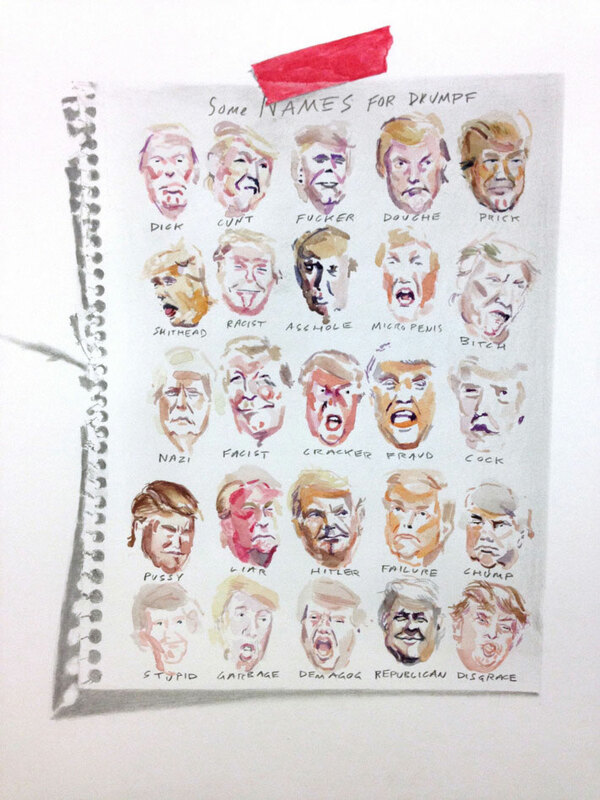 Keeping in mind the extremely cartoonish nature of Trump’s facial expressions, the artist painted each one to lend color and shape to his portraits. The entire series is just basically little amazing paintings and blobs, incorporating his particular palette of orange that is remonstrative of his emotional range of bluster. This project was designed for Smack Mellon as a shot at taking a swing at someone like Trump, who is nothing short of a noxious figure. 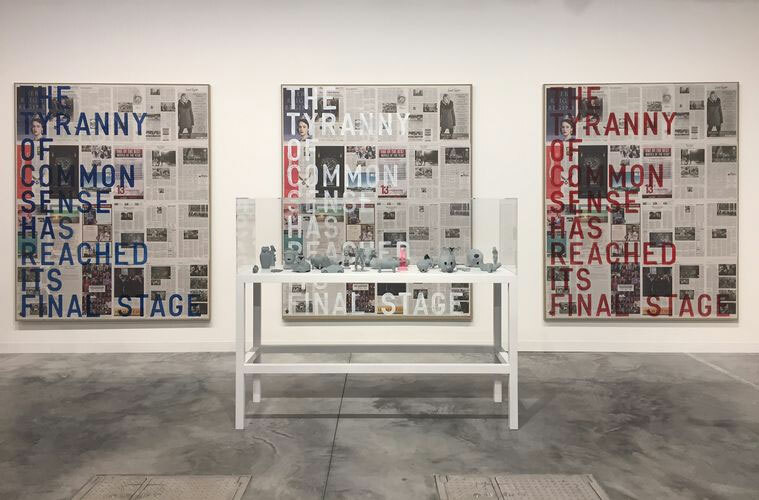 Thai Artist Rirkrit Tiravanija exhibited three particularly incendiary pieces at a Blum & Poe gallery outpost. She tore out pages from the November 9 edition of The New York Times in which the contradictions of fiction and reality were starkly visible, curated them into collages, and stamped each medley with the same ominous message of “The Tyranny of Common Sense Has Reached Its Final Stage,” which is a quote from Aldo van Eyck. Such an impactful art project instantly became viral and called people out to action. Veteran illustrator Tim O’Brien was given a rather challenging Assignment brief: Think “Trump in a hurricane.” In a whirlwind of creative overflow, he had a few days to turn around a potent illustration, depicting the chaos inside the White House. 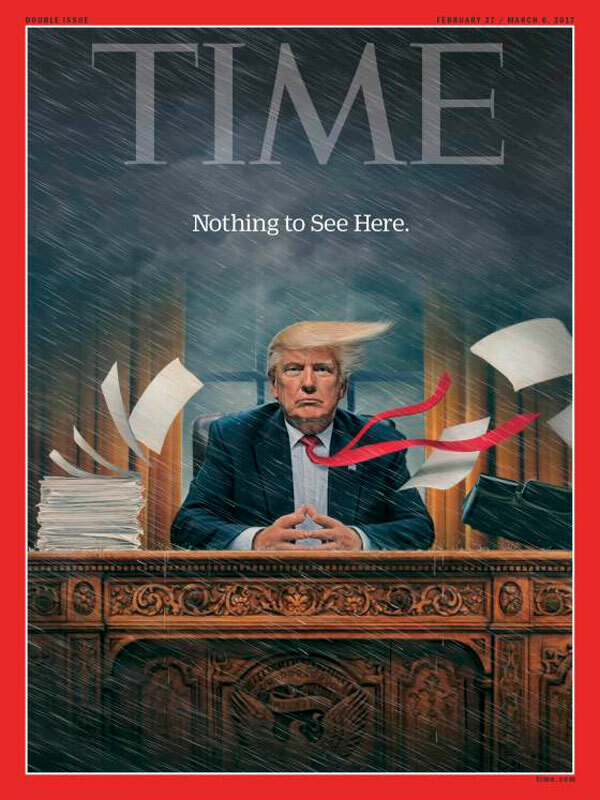 The result is featured on the cover of the Time’s Magazine, featuring a striking portrait of the president, in conjunction with the caption, “Nothing to See Here”. The flapping hair, the driving rain, and of course the swirling papers lend an instant gravitas to the illustration. 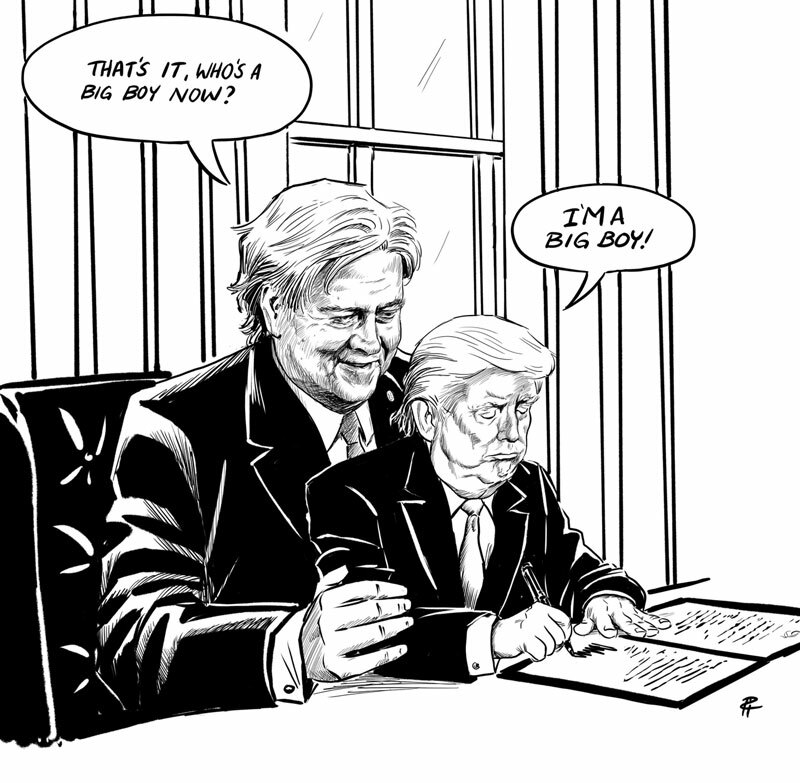 Vancouver based Artist, Pia Guerra’s political cartoon depicting the relationship between the White House Chief Strategist Steve Bannon and President Trump, has gone viral. After Bannon’s invitation to the Principal’s Committee of the National Security Council was announced to much public uproar, Bannon switched his role as an executive at Breitbart News, to run Trump’s presidential campaign. To top it off, this hotly-contested move came at a time when both the chairman of the Joint Chiefs of Staff and the U.S. director of National Intelligence lost their permanent membership on the council. Critics, like Pia, strongly asserted that a political strategist is not suited to advising on national security issues. 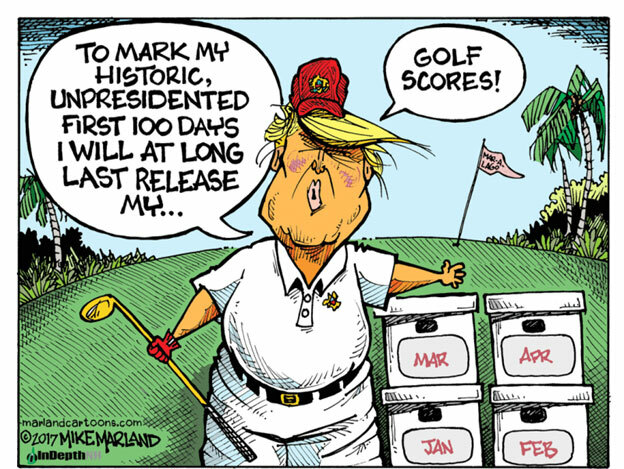 While Mike Marland is a pro at regional New Hampshire commentary, his 100 Days cartoon has gone viral since it sums up more than Trump’s first 100 days of Presidency. 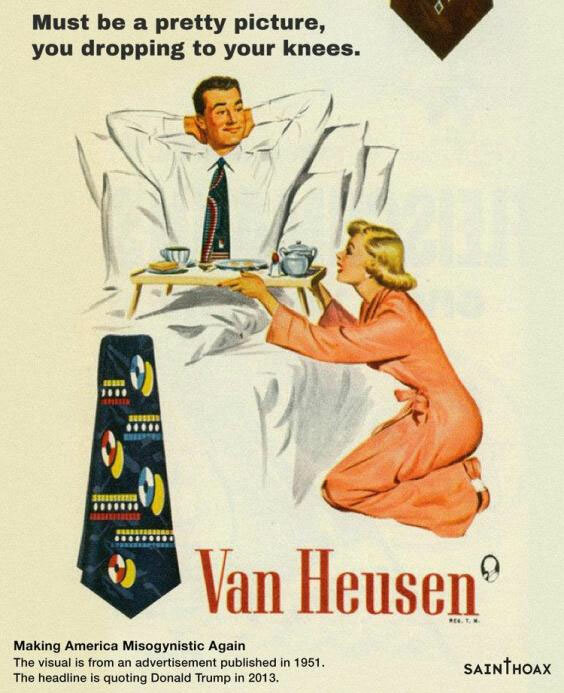 The phrase, “The soft bigotry of low expectations”, that conservatives often resort to using to derail civil rights policies, is what comes to mind when looking at his illustrations. People were so sure of Trump’s inability to make good on his promises, and neither did he intend to, that when he actually failed to do so, it didn’t disappoint anyone in the least or gave us much to talk about. If the notion of Donald Trump sitting the Iron Throne makes you shiver in your sleep, wait until you sneak a peek at him as a zombie overlord leading a morbid army of undead to rule the world. 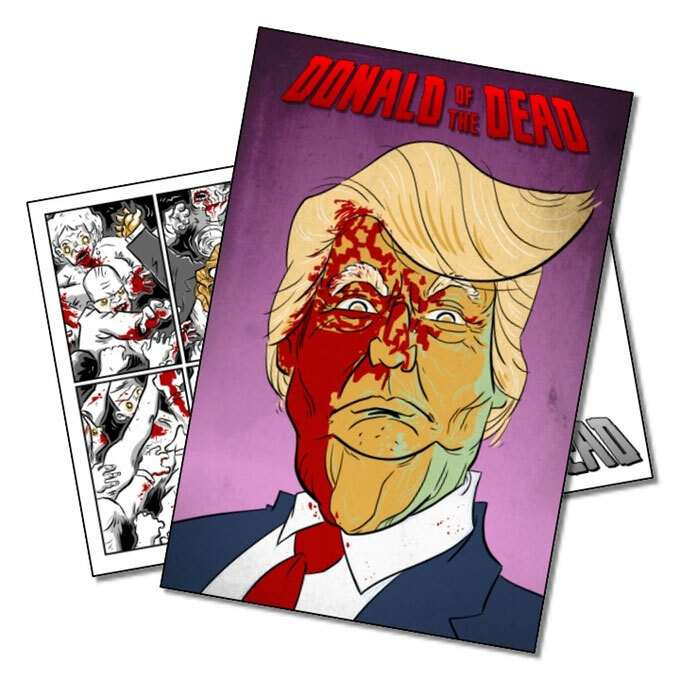 Brain child of the creators of Hero Happy tour, Chris Fason and Dan Taylor, the creative comic book, titled the Donald of the World, features at least 32 undead orange and blood red enhanced black & white pages. Apparently garnered from sources in the US and Russia, Dossier claimed that the Russian Regime has been assisting, supporting and cultivating MR. Trump for the last 5 years. The US President passed off the salacious claims in the 35-page document as "phoney stuff", "fake news", and "nonsense". However that didn’t stop the newspapers, and Peter Brookes, from poking fun at the episode. 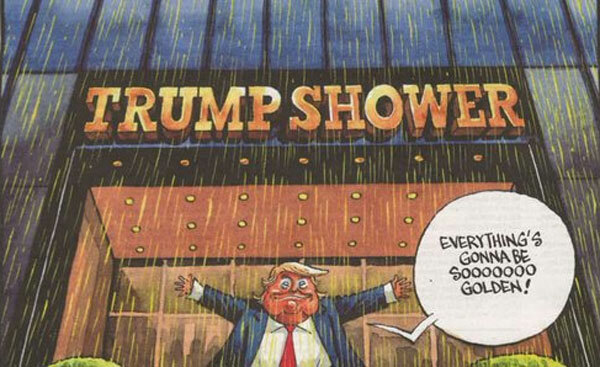 In his hilarious political cartoon, Trump is seen standing outside "Trump Shower", with a stream of yellow rain pouring over him, yelling "Everything’s gonna be sooooo golden!" Andrea Bowers capitalizes on materials found at protests — pithy slogans, cardboard placards. Andrea has stayed an activist for 15 years, attending various actions across the country and helping Teamsters unionize Frieze art fair, in addition to several other ventures. 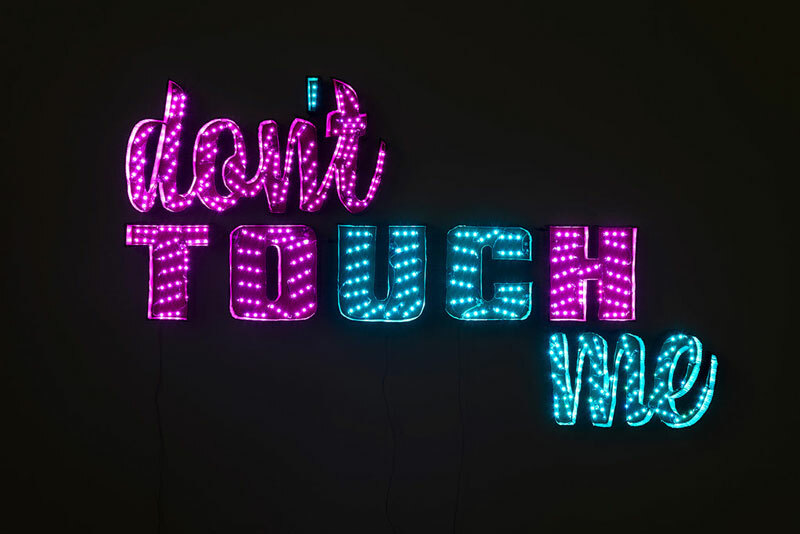 Her protest art above was created in the wake of the election, and debuted at Art Basel Miami Beach in December 2016. The artist felt irate that Donald Trump still won the election after everything he had publicly spat about women, and decided to make that protest sign a feminist gesture. The result of the election made her more determined than ever to protest art and to be more aggressive regarding the issue. If you want your Halloween jack-o’-lantern to make people run screaming for their lives, horns and fangs would fail to do what carving the presidential candidate who loathes abortion, declared he’d like to ban Muslims from the U.S., and aspires to alienate Mexico by building a wall, would accomplish. Last Halloween, a score of Pumpkin-carving aficionados carved a horrifying likeness of Trump on their Gourds, including Jeanette Paras’ 374-pounder above. Halloween has become a whole new level of scary now! Pun master and Street art prankster Hanksy thinks that our president is a piece of crap and can’t wait to tell everyone about it. As a pseudonymous artist whose art often borders at illicit, he made his paints his megaphone since publicly raising his voice would blow his cover. 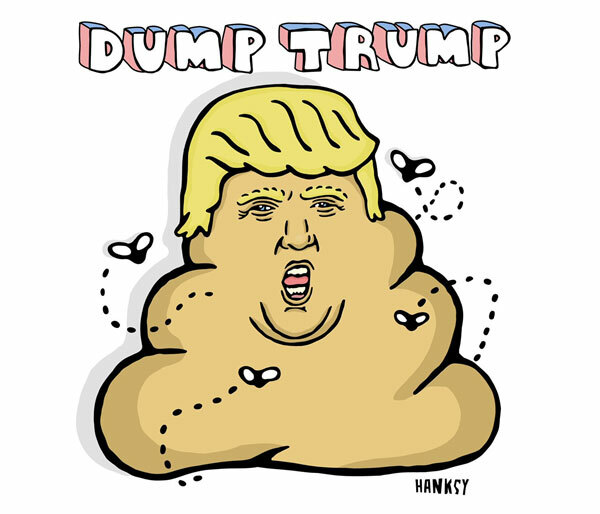 On a wall in New York City’s Lower East Side, he has drawn Trump’s face over a pile of poop, and finished off the illustration with a bright yellow toupee. The flies surrounding the pile could be a hint at the Trump Cabinet perhaps. Swedish graphic designer and illustrator Caty Aguilera has designed a festive Piñata in response to Trump’s hateful comments about Mexicans. A piñata is a traditional decorated figure in Mexico that an offended party can beat up until it breaks open. Appalled and astonished about a score of things, ranging from the ignorance, the racism, and the fact that people actually supported a person like Trump, made the artist want to counter act with her design based response to what she was feeling and hearing. 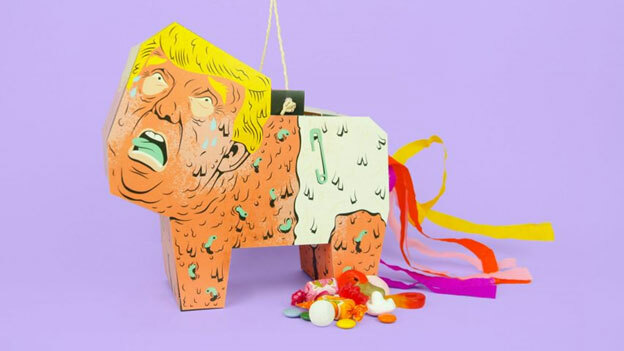 The paper piñata imitates Trump clad in a nappy, and has a string so that it could be suspended from the ceiling, making it easier for people to hit it in a festive manner. 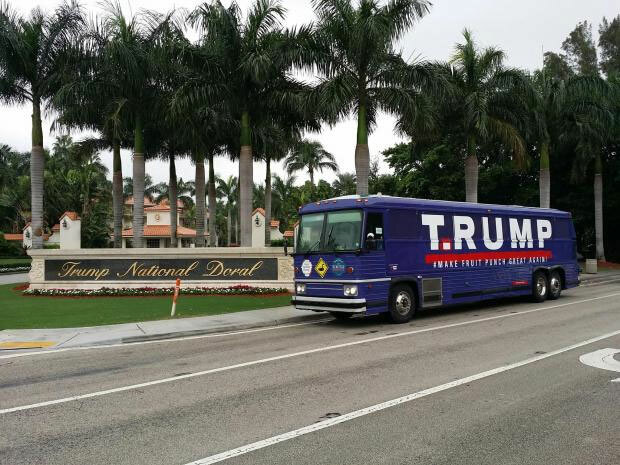 When a tour bus emblazoned with Trump logos and used by the president popped up on Craigslist, Mary Mihelic and David Gleeson sensed an opportunity. They immediately bought it and started brainstorming what to do with the piece of raw material. They kept their alterations minimal and took to driving it around to Trump rallies to fool ardent supporters who came after the familiar red, white, and blue. The bus was a great platform for answering the daily belligerence of Trump; be it sexist, religious, racial, or his teasing of a handicapped reporter. Can you think of any more great artworks defying the Trump regime? 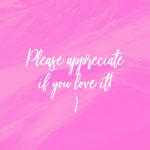 Do share with us in the comments below!